These HAP measurements are very interesting but on their own I don’t think they justify the conclusions you draw. As you mention later in the post, what you actually want to measure is the amount of kernel code that a compromised container could exercise (weighted by bug density). You seem to assume that is proportional (or ideally equal to) to the amount of kernel code actual exercised by the container post-startup, i.e. that there is a “well crafted seccomp profile” in place to ensure this, but it is not always possible for seccomp to restrict kernel exposure to just what one particular container workload does. For example seccomp can’t check the pathname passed to open(), so the container’s filesystem view needs to be carefully locked down or an attacker could potentially exercise all kinds of crazy of kernel code. But a wide-open container filesystem view would not change the results you have shown here, thus these results could lead to the wrong conclusions. OK,so I think the question is whether seccomp can restrict the HAP exposure of a given docker image. I also think you might not be aware of seccomp-filter which definitely can do things like checking the pathname to open(). When you supply a seccomp profile for docker you usually use various filters, so I’m fairly confident that, given any workload and the syscall trace via ftrace, you can craft a docker seccomp profile that tightly fits its needed syscall profile and effectively restricts its kernel penetration to what we’ve measured. As it happens I’m the lead author of https://rr-project.org, which uses seccomp-filter as a core part of its performance optimizations (see https://arxiv.org/abs/1705.05937). You can’t use seccomp filters to check open() paths because seccomp-filter BPF programs can’t dereference user memory. Even if they could, or if you use SECCOMP_RET_TRACE to implement a selective ptrace jail (at much higher performance cost! ), there would be a TOCTOU vulnerability because the path could be modified by other threads between seccomp filters running and the path actually being read by the open() syscall. I think to repair your argument you’ll have to talk about what your nine syscalls are and what specific mechanisms exist — or will be built — to limit the kernel code reachable from those syscalls. I’m not sure where “nine system calls” come from. However, the team did measure the number of system calls used by the tests so it’s 8,10,8 for the three tests. 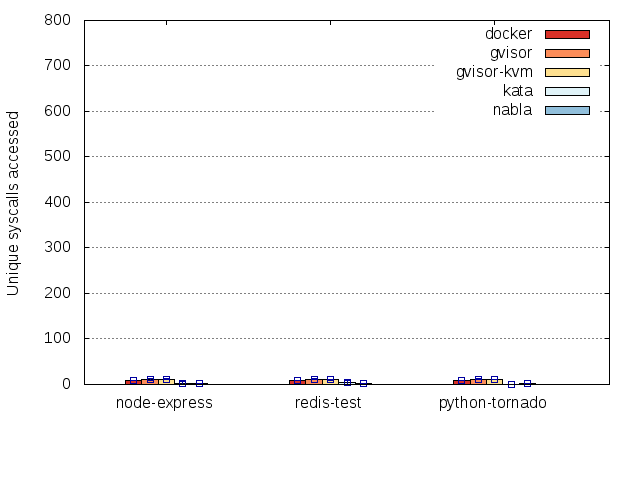 I think it’s uncontroversial that seccomp can block the other unused system calls and the ftrace LOC methodology is fairly maximalist, so I wouldn’t expect the docker coverage to go up significantly even when we apply fuzzing to the profile, so docker being within 30% of a hypervisor using a seccomp profile on these tests is maintainable. I enjoyed reading your blog posts, and find your HAP measurements and results interesting. We performed a study that drew a lot of the same conclusions about container vs VM security. One thing, however, I think you might want to reconsider in moving forward is the assumption that bug density is uniform in a code base. Based on studies of the Linux kernel conducted over the last year, our research group has found that the “popular paths” tend to contain fewer bugs than the less frequently used paths. Using the Gcov kernel profiling tool in our study, and being able to capture the kernel code trace data at the line-of-code level also enabled us to see the details of the code coverage inside functions. Approximating the HAP based on the amount of code traversed appears to be a useful approach to quantitative measurements, but being able to see individual line of code might further enhance its effectiveness. What we took away from our work was that it is important to not only reduce the total amount of code accessible, but also the right type of code. If you are interested, feel free to check out our paper at (https://www.usenix.org/system/files/conference/atc17/atc17-li_yiwen.pdf). (Right now we are applying our “popular paths” metric on the LinuxKit container to reduce access to the risky “unpopular” code in the host kernel.) We are looking forward to seeing more of your work in the future!